The quaint town of Cuero is a place of many names. Not only is Cuero known as the “Heart of South Texas” because it sits at or near the intersection of six state highways, it’s also the “Wildflower Capital of Texas” and the “Turkey Capital of the World.” Even Cuero’s many titles aren’t enough to summarize the many experiences you can have here. Take an interactive cooking class lead by a professional chef at The Cooking Depot, paddle down one of the most-visited rivers in Texas, taste the state nut at the Cuero Pecan House, and immerse yourself in cowboy culture at the Chisholm Trail Heritage Museum. Attend the many events at Cuero Municipal Park, like the popular Cuero Turkeyfest, and explore the charming downtown area. Already planning your road trip to Cuero? 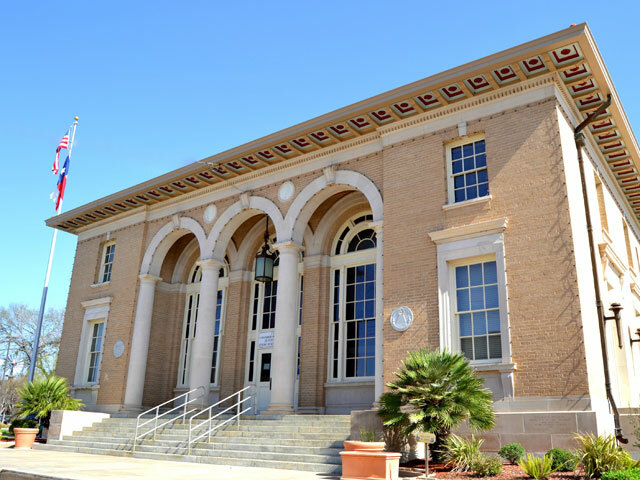 Slow down, partner, and take a gander at this list of attractions in Cuero so you get the full picture of what this town has to offer. The Chisholm Trail Heritage Museum is one of the must-see attractions in Cuero as it’s a one-of-a-kind showcase of the cowboy culture that is synonymous with Texas. Try your hand at cowboy skills like roping and keepin’ your mind in the middle on a saddle, and get up close to an authentic chuck wagon. After you learn all about longhorns, the great cattle drive era, and the American cowboy, be sure to shop at the Chisholm Trail Heritage Museum’s gift shop for the perfect Western souvenir. Talk about experiential tourism! At The Cooking Depot in Cuero, take a cooking class from an expert chef, like “Grillin’ and Chillin’” or “A Gourmet Evening” — be sure to reserve your spot in advance. Don’t miss the opportunity to browse The Cooking Depot’s large selection of mixers, serving utensils, glassware, linens, and other kitchen goods from a large roster of brands. Play nine holes of golf at the Cuero Municipal Golf Course, featuring 3,220 yards from the longest tees for a par of 3, a course rating of 35.2, and a slope rating of 110. Cuero Municipal Park is where it all happens. Several large events are held here each year, including Cuero Turkeyfest and Christmas in the Park. This massive park has it all: an 8.5-acre lake, a two-mile trail, sand volleyball courts, a softball field, a baseball stadium, soccer fields, a basketball pavilion, a four-field little league complex, a nine-hole golf course, and more. Stop by the Cuero Heritage Museum to get an idea of what this town is all about. Admire original photos and costumes that depict why Cuero is called the “Turkey Capital of the World," an impressive collection of antique juicer reamers, 100 years of Gobbler football, and learn all about Katy Doell, singer, professional trick rider, and bull rider that left a big impression on this small town. Make your taste buds do a two-step in delight at the Cuero Pecan House, proprietors of goodies made with Texas pecans. Savor freshly-made cinnamon pecans, orange sugar pecans, hot ‘n spicy pecans, pecan brittle, pecan pie, fudgy pecan pie, dark-chocolate-coated pecans, pecan pie bars … you get the pecan point. Cuero Pecan House is also THE stop for gift baskets and other homemade dishes like King Ranch casserole, Tieken’s enchilada casserole, and chicken pot pie. Tour the historic F. W. Bates and H. D. Sheppard home that now serves as the DeWitt County Museum, where you’ll see treasures like antique tea pots, vintage China, and original photographs. Relax on one of the most popular waterways in Texas: the Guadalupe River. Cuero is part of the Texas Parks and Wildlife Paddling Trail, and you can put your canoe or kayak in here and paddle down the river and enjoy the wildlife and gorgeous sunrises and sunsets from the water. The Guadalupe River Paddling Trail is 13.8 miles in length. The trail can be accessed from where FM 766, FM 236, and Highway 72 intersect with the Guadalupe River. Step back in time at the Pharmacy and Medical Museum of Texas, located inside a beautiful historic building on Main Street that was built in 1889 as a pharmacy. Even to today, the museum has many original elements that you can see like the display counters, wall cabinets, and pharmacist’s preparation bench. View valuables like vintage cosmetics, antique medicine bottles, and old box cameras.